AutoTuned kingpin Future is currently in the middle of a North American tour, and apparently used a bit of travel time to make a simple video for his Honest single "Side Effects." The video is pretty laid back, finding the star spitting his bars and wagging his fingers at a camera during air travel. While high in the sky, we get him dropping dedicated bars to someone back home that minds his crib and gets his groceries. 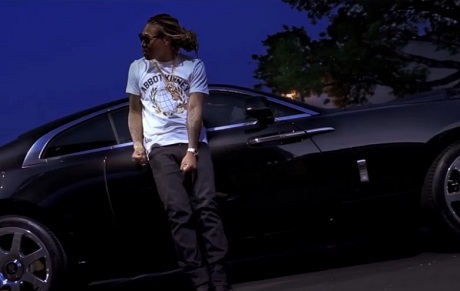 After landing, Future decides to further praise his one and only while leaning against a whip parked in a basketball court. If Future's name is already tatted on your heart, you've probably already pressed play down below. His Honest tour, meanwhile, rolls through Canada in early July. You'll find the show specifics over here.